Join the discussion on our forums! 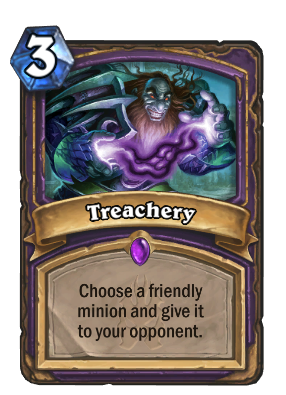 Come discuss Treachery over in our dedicated Treachery discussion topic. Choose a friendly minion and give it to your opponent. Never look a gift minion in the mouth. The best combo I've found is Howlfiend+Treachery. Esp. to gum up all those Quest Mage and Mill Rogue decks that depend on some intricate machine shenanigans to win. Just keep a couple of ping spells like Mortal Coil and Defile and a Sacrificial Pact around to cleanup the mess before you end turn. When you break their hand on T8, they lose tempo, and usually have no answer to your demons. If you're serious about Handlock but don't want to build a deck of just removals and AoE's, IMHO this is the one combo to have. Fel Reaver never got to see a use during its life.. but maybe now, after it started to rot in wild? Shoot! His flavor text is not "Here's a little lesson in treachery, this is going down in history! "If you want to be a warlock number one, you have to give your opponent minion worth none!" What Wowhobbs have been asking for. Unfortunately it is for warlock. This could have been insane in priest. Warlock alternative to Frost Nova for doomsayer. There might be interesting options with Unlicensed Apothecary. Can be comboed with Summoning Portal and Leeroy Jenkins for 16 dmg - can't figure out yet wheter it's possible to OTK without Emperor Thaurissan. Play Unlicensed Apothecary and then give it to your opponent with Treachery. Play Leeroy, who will summon two 1/1s for your opponent, making the Apothecary deal 10 damage to their face. Leeroy is an additional 6 damage. It's too bad that this is 11 mana, even with Summoning Portal, but I'm determined to make Treachery work in some deck this season. Does that mean, that this also works if your opponent has Primalfin Totem on board? Only if Unlicensed Apothecary is still alive at the end of their turn. And now we can add another card the the synergy soup: Wailing Felhound.